Click to link up to Darnell's birthday party before July 16. 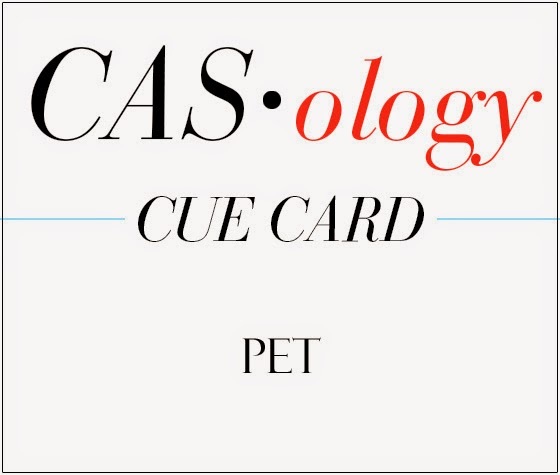 This week's CASology Cue Card is Pet. Many of you know that one of my sisters is an equine surgeon. 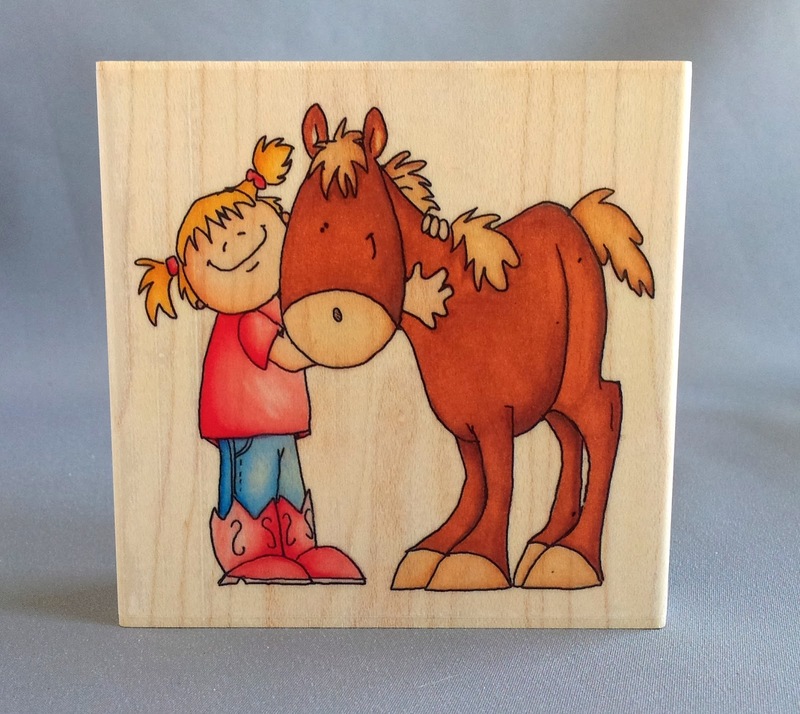 Since she was big enough to know what a horse was, she knew what she was going to do with her life! 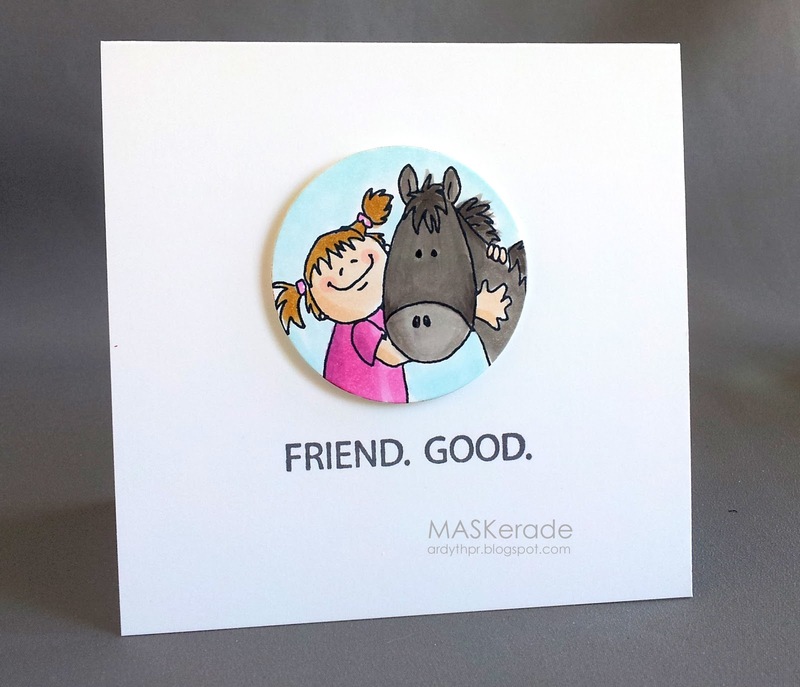 I make horse cards for her to give to her clients and friends, and I collect horse images and sentiments. This Whippersnapper Designs image is really a fantastic one - it clearly shows the joy that a horse can inspire. But I felt that it was a little big to use on a CAS card. Solution? 'Crop' it by cutting out only a portion of the image and create lots of white space. I finished the card with an old Stampin' Up sentiment (a quote from Frankenstein's monster, actually!). And now it's your turn - but before you go, make sure you drop by the other DT members and see what they came up with for your inspiration! FABulous! Cropping! Genius! I have to say that is the sweetest horse imagery I have come across. I just love how tenderly that little girl is holding it around its neck! Pure rapture on her face! It's precious! 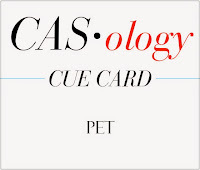 So very cute, yay, thanks for sharing where you get some of your fun stamps too , love how you edit, and that pet is pet in the verb AND the noun aspect, always so clever!!! Love your image and coloring Ardyth. Popping it up added dimension and made it pop. This is too cute Ardyth! Great colouring. Eeek! This is just adorable! Love how you made the image work by cropping it like this!!! So sweet! Perfect way to crop this image Ardyth. Adorable. Aww...This is so cute! Love! Love the stamp and cropping it was a great way to go. Great job on coloring, it's so CUTE! I did not know that you can do cute as well! Love this card! This is not a typical Ardyth style card and I really love it. I agree focusing on a portion of a stamp has much more impact. I can't decide if I like the image or the sentiment more... but together, they make for the cutest card! Cute, cute, cute! I love your cropped image. I'm seeing as much love on the horse's face, Ardyth, as I'm sure happens in your sisters life. Just so darling!